Kalla has been becoming quite the accessory girl. 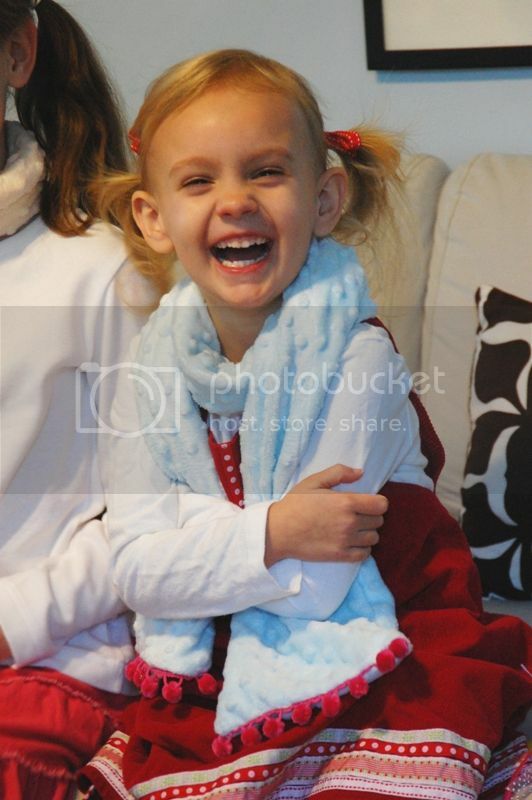 She has gone from dislike of any type of jewelry or anything else of that nature (mostly due to sensory issues) to the love of all things sparkly. 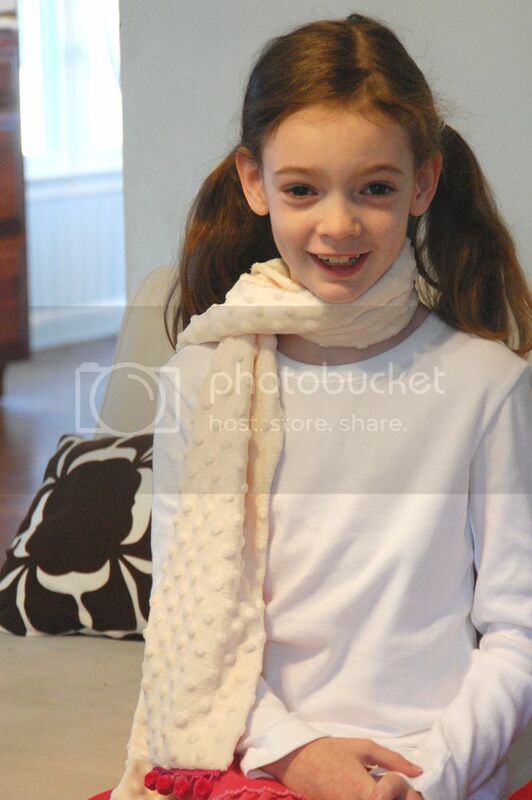 She has grown fond of necklaces and bracelets and wears them daily. And as the days grew colder and colder at the end of the last year, she was wanting a nice warm scarf to wear with her coat. So I made the girls a fun and super soft winter scarf as a gift for Christmas. I made this same scarf actually about 4 years ago as an added accessory to a custom boutique outfit I was selling on eBay. I loved it back then, but sent the one and only away with the sold outfit. So when a scarf was requested I knew this would be the perfect scarf for little girls. Something so soft they would love the feel against their delicate faces and necks. And to be honest I love them too. I wear them sometimes around the house when I have a chill. When my neck is warm, it helps keep me warm all over. And they do feel SO good and soft. This is a knit material, but if you use a ball p point needle and be gentle and take your time, minky is no hard to sew. First, fix one pom pom trim to the short end of your minky strip. 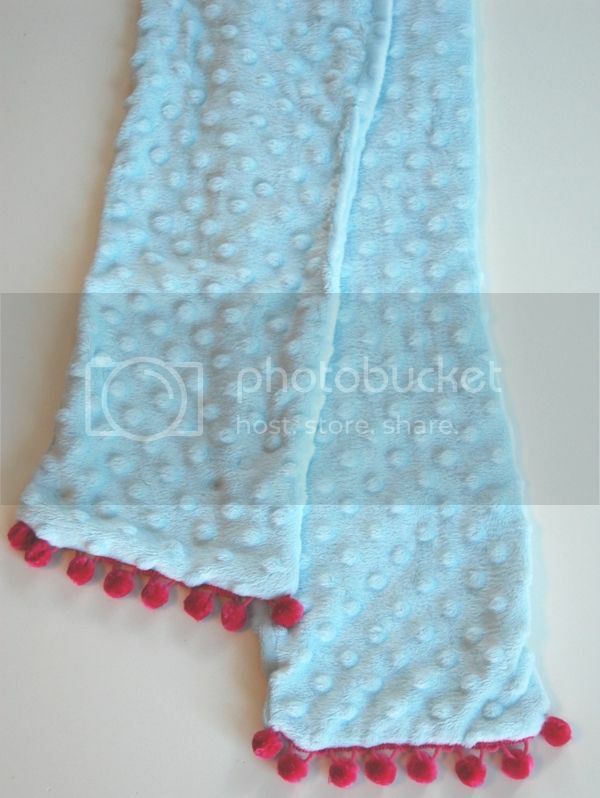 Place it to one edge with pom poms facing in on the fabric, on right side of fabric. 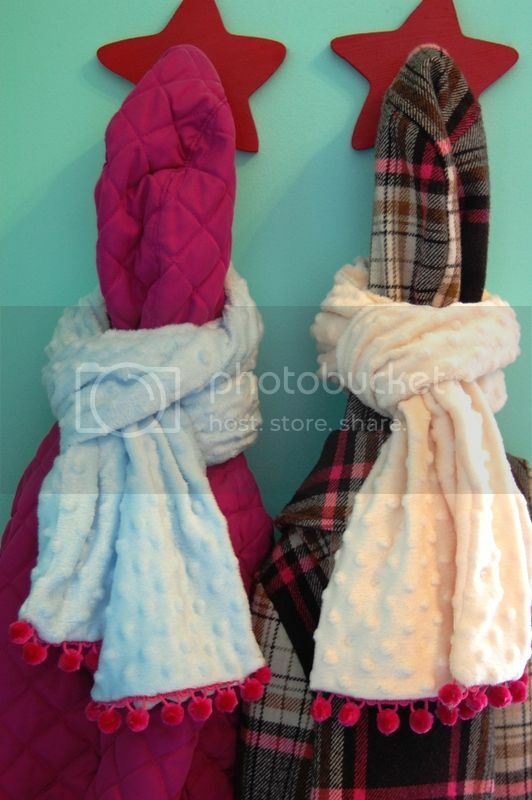 You can sew it down if it helps, or just pin in your scarf sandwich like in the next photo. Now fold over length-wise so that wrong side is facing out and right sides are together. Pom pom trim should have pom poms tucked inside and should be the length of your edge when folded. 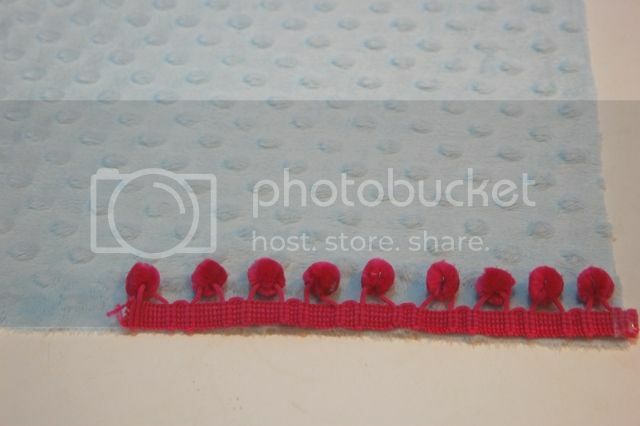 Do this with both short ends of the minky strip pinning as you go. Pin the entire length of fabric with all edges lining up. Now sew all edges being careful to leave a 5" hole or so along the long side of scarf. You will then turn it right side out. 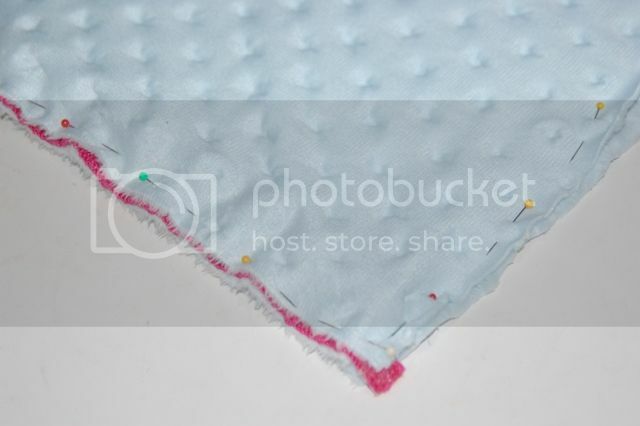 The hole can be sewn together by hand or the lazy way like I do topstiching it carefully along the edge along the hole. That's it! Would make a wonderful Valentines gift for your little sweeties. Oooh, those look so soft! I want one of these for myself!! Those look so cozy! How do you find the time to do all this stuff? You're amazing! Is the 62" length for an adult scarf or a child scarf?